What are the Pros and Cons of a Large Heatsink? 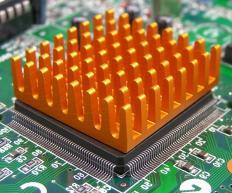 Heatsinks are designed to move heat away from a computer's central processing unit. There are a number of different benefits and drawbacks involved in using a large heatsink, including issues related to heat dispersion and the amount of room it takes up inside of a computer tower. One of the major benefits is that the heatsink may be better able to transfer large amounts of heat away from the central processing unit (CPU) of a computer, both by coming into contact with the CPU more effectively and by having more area to distribute the heat. On the other hand, a large heatsink can be very loud and may also take up a great deal of space, thereby making work in the computer difficult or making certain parts of a motherboard inaccessible. A heatsink is a device that is installed inside of a computer by attaching it to the CPU on a computer’s motherboard. It transfers heat away from the CPU and then releases that heat into the computer tower, where fans blow the heat out of the tower. A large heatsink is merely a heatsink that is large in size, and is usually made that way in an attempt to more efficiently reduce heat within the system. If a CPU overheats due to usage, it is more likely to fail and shut down the computer or sustain permanent damage that can result in the CPU needing to be replaced. One of the major benefits of a large heatsink is that it can often pull away heat more effectively from the CPU. While this is not always the case, a large heatsink is usually designed to have more surface contact with a CPU to allow more effective heat transfer. The larger design also tends to include greater surface area for the heatsink's cooling area, allowing air to pass through the heatsink itself and then transfer the heat to the surrounding air more effectively as well. This can be quite beneficial for people who run powerful computers or tend to overclock their CPUs to be more powerful. A large heatsink, however, will tend to take up a great deal of space inside of a computer case. This can make installing other components more difficult, especially if the computer has a small motherboard. The heatsink may even make it impossible to access some of the ports and plugs on the motherboard, depending on the size and design of the board. A large heatsink can also be very loud, and may lead to a computer that could be described as sounding like an airplane or similar machine during usage. While some computer users may not have a problem with this, it can be quite distracting when used in a room where people view television or prefer quiet. What Is a Mini Computer Tower? How do I Choose the Best Custom Heatsink? How do I Choose the Best VGA Heatsink? What is a Fanless Heatsink? What is a Motherboard Heatsink?